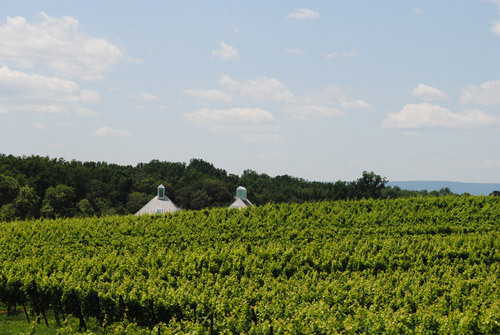 Middleburg, Virginia has become the state’s newest American Viticultural Area. Middleburg is the seventh Virginia AVA, joining Eastern Shore, Monticello, North Fork of Roanoke, Northern Neck George Washington Birthplace, Rocky Knob, and Shenandoah Valley. The area, 50 miles (80km) west of Washington DC, bounded by the Potomac River to the north and the Blue Ridge Mountains to the west, has ten commercial vineyards consisting of 229 acres (92ha) of vines, and 14 wineries. The process for applying to the US government’s Alcohol and Tobacco Tax and Trade Bureau (TTB) was started in 2006 by Boxwood Estate proprietor and vice-president Rachel Martin; various names for the AVA were proposed, with some parties preferring Northern Virginia Piedmont. The region grows some dozen different varietals, including Cabernet Sauvignon, Cabernet Franc, Chambourcin, Chardonnay, Malbec, Merlot, Petit Manseng, Petit Verdot, Sauvigon Blanc, Seyval Blanc, Syrah, Tannat, Traminette, Vidal Blanc and Viognier. Red Bordeaux blends are common, as are varietal wines such as Cabernet Franc and Viognier. Middleburg wines have had some international successes, notably Boxwood Estate’s Silver and Bronze at the Decanter World Wine Awards for its two blends, Topiary and Boxwood. Five other Virginia wineries won medals at the DWWA this year. Virginia is celebrated as the birthplace of American wine, with a viticultural tradition that goes back 400 years to early colonial attempts to plant vines. Today there are some 200 wineries in the state, including Donald Trump’s Trump Winery in the Monticello AVA. This entry was posted on October 2, 2012 by The Oenophiliac in News. and tagged Blue Ridge Mountains, cabernet franc, cabernet sauvignon, Chambourcin, Chardonnay, Malbec, Merlot, Monticello AVA, Petit Manseng, Petit Verdot, Rocky Knob, Sauvigon Blanc, Seyval Blanc, Shenandoah Valley, Syrah, Tannat, Traminette, Vidal Blanc, Viognier, Virginia, Washington DC, Wines from USA.